John Dahlbäck returns to North America this weekend for a month long jaunt through the United States and Canada. The tour coincides with the release of John’s new single, ‘Life (Diamonds In The Dark)’, which is out February 25 through Big Beat/Atlantic. 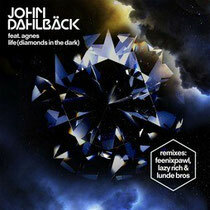 Many dance fans will be familiar with John Dahlback's 2012 club anthem, ‘Life’, which was Pete Tong's Essential New Tune as well as being included on Tiësto’s ‘Club Life - Vol. 2 Miami’. The track now gets a whole new vocal version from fellow Swede Agnes along with remixes from Feenixpawl, Lazy Rich and Lunde Bros.